The purpose of this study was to evaluate and compare the effect of grit blasting, chemical treatment, and application of alloy primer combinations on the shear bond strength (SBS) of a self-cure resin cement to titanium surface. Materials and Methods: Fifty cast commercially pure titanium discs (9 mm × 2 mm) were divided into five groups (n = 10), which received the following surface treatments: Control group (no surface treatment), group 1 (grit blasting using 110 µm Al2O3particles and application of alloy primer), group 2 (grit blasting using 110 µm Al2O3particles and chemical treatment using 1N HCl), group 3 (chemical treatment using 1N HCl and application of alloy primer), and group 4 (Grit blasting using 110 µm Al2O3particles, chemical treatment using 1N HCl and application of alloy primer). Superbond C and B resin cement was applied to the treated titanium surfaces including controls. SBSs were determined after thermocycling for 5000 cycles. Data (megapascal) were analyzed by ANOVA and Bonferroni test. Results: Group 4 (grit blasting using 110 µm Al2O3particles, chemical treatment using 1N hydrochloric acid, and application of alloy primer) produced the highest bond strength followed by group 1, group 3, group 2, and the control group which showed the least bond strength. Conclusion: (1) Air-abrasion with alumina particles increases the micromechanical retention of the resin to titanium. (2) The alloy primer promotes wettability, which increases the adhesive bonding of resin cement to titanium. (3) Chemical treatment using hydrochloric acid effectively pretreats the titanium surface thereby increasing the SBS values. Titanium is known as the exotic "space age" metal because of its light weight and high performance in aeronautics. This wonder metal has many advantages as a prosthetic material such as excellent biocompatibility, high strength to weight ratio, low density, sufficient corrosion resistance, and low cost compared to noble alloys and therefore, has gained popularity in dentistry.,, Today titanium and its alloys are used in dental implants, implant frameworks, crowns and bridges, resin bonded bridges, post and core, partial and complete denture frameworks. Many of these restorations are luted with resin cements. The strength of the cement/metal bond is significantly affected by the intimacy of contact between the surfaces of the materials. The intimate contact is optimized when the luting material is capable of flowing into the surface irregularities of the metal surface. Therefore, the properties of the luting cements and metallic substrate surface micro-topography play an important role in preventing debonding of the prostheses. Surface treatment of the titanium by sandblasting with A12O3 particles improves the effectiveness of the surface area of the metal and increases the composite resin-metal bond strengths. Chemical etching of titanium using hydrochloric acid, phosphoric acid or sulfuric acid enhances micromechanical bonding by pretreating titanium to make it more receptive to the resin. Chemical bonding of metal to composite resin involves coating the metal with alloy primers or silane coupling agents that contain functional monomers. These functional monomers promote chemical bonding between the cement and the oxides present on the metal surface. Despite the research, the nature, and the variables affecting titanium-cement junction are still unclear. The current study was concerned with the bonding of resin cement to titanium surface and how we could improve the bond strength at the cement-titanium junction. Previous studies , 10, ,, have used individual surface treatments to increase the bond strength at the cement-titanium interface, but there are no studies, which have used a combination of different surface treatments. Hence, the aim of this in vitro study was to use different combinations of surface treatment to increase the shear bond strength (SBS) at the cement-titanium interface reducing the chances of failure of the prosthesis. Group 4 - Grit blasting using 110 μm Al2O3 particles, chemical treatment using 1N hydrochloric acid, and application of alloy primer (V-primer). Airborne particle abrasion using 110 µm Al2O3 particles was performed for 10 s at an angle of 90° under 0.28 megapascal (MPa) air pressure, held at a distance of 10 mm from the specimen surface. Subsequently, all the specimens were cleaned in distilled water for 10 min using an ultrasonic cleaner and air-dried. Alloy primer was applied to the abraded titanium surface with a disposable brush for 15 s and left to dry for 60 s at room temperature. Airborne particle abrasion using 110 µm Al2O3 particles was performed for 10 s at an angle of 90° under 0.28 MPa air pressure, held at a distance of 10 mm from the specimen surface. Subsequently, all the specimens were cleaned in distilled water for 10 min using an ultrasonic cleaner and air-dried. The specimens were then immersed in 1N solution of hydrochloric acid for 5 min at room temperature. The specimens were then washed with distilled water for 10 s and air-dried for 5 s.
The specimens were cleaned in distilled water for 10 min using an ultrasonic cleaner and air-dried. The specimens were then immersed in 1N solution of hydrochloric acid for 5 min at room temperature. The specimens were then washed with distilled water for 10 s and air-dried for 5 s. Alloy primer was applied to the treated titanium surface with a disposable brush for 15 s and left to dry for 60 s at room temperature. Airborne particle abrasion using 110 µm Al2O3 particles was performed for 10 s at an angle of 90° under 0.28 MPa air pressure, held at a distance of 10 mm from the specimen surface. Subsequently, all the specimens were cleaned in distilled water for 10 min using an ultrasonic cleaner and air-dried. The specimens were then immersed in 1N solution of hydrochloric acid for 5 min at room temperature. The specimens were then washed with distilled water for 10 s and air-dried for 5 s. Alloy primer was applied to the treated titanium surface with a disposable brush for 15 s and left to dry for 60 s at room temperature. Superbond C and B self-cure resin cement were applied to the surface of all the specimens including controls. A custom-made metal split matrix (5 mm internal diameter and 2 mm thickness) was placed on the center of the titanium disc. The purpose of the matrix was to allow the addition of the resin cement at a constant diameter and thickness on the metal substrate. The cement powder was proportioned by weight and mixed with the catalyst and monomer according to the manufacturer's instructions and inserted into the matrix. A glass slab and a weight exerting 500 g were placed on top of the cement to permit overflow of a slight excess of material. The specimens were left undisturbed for 15 min, and the excess cement was removed. All the specimens were stored in distilled water at 37°C for 24 h. All the samples were thermocycled 5000 times in water between 5°C and 55°C. The dwell time at each temperature was 30 s with a transfer time of 15 s between baths. The specimens were then subjected to shear load of 1kN with a universal testing machine (Model LR 50K; Instron Corp, Lloyd Instruments). A knife-edge chisel apparatus (5 mm blade length) running at a cross-head speed of 0.5 mm/min was used to direct a parallel shearing load at the resin cement/metal interface. SBS values were recorded in MPa). The SBS values were evaluated, and the mean SBS and standard deviation for each group were calculated [Table 1]. This in vitro study rejected the null hypothesis as there was a significant difference in the mean SBS values among all the groups. ANOVA test was performed to compare the mean SBS values among different groups. Highest mean SBS was recorded in group 4 (9.171 ± 0.301 MPa) followed by group 1 (7.593 ± 0.245 MPa), group 3 (6.135 ± 0.546 MPa), group 2 (4.041 ± 0.333 MPa), and control group (2.458 ± 0.367 MPa). The difference in mean SBS among the groups was found to be statistically significant (P < 0.001) [Table 2] and Graph 1]. In order to find out among which pair of groups there exist a significant difference, Bonferroni test (post-hoc test) was applied [Table 3]. The results of this study concluded that the highest mean SBS was recorded in group 4 (9.171 ± 0.301 MPa) followed by group 1 (7.593 ± 0.245 MPa), group 3 (6.135 ± 0.546 MPa), group 2 (4.041 ± 0.333 MPa), and control group (2.458 ± 0.367 MPa). The group 4 specimens, which were abraded with 110 µm Al2O3 particles followed by chemical treatment using 1N HCl acid and application of alloy primer produced the highest SBS values. Air-abrasion with 110 µm Al2O3 particles created a rough surface, which increased the surface area for bonding. Chemical treatment of the abraded Ti surface was done using 1N HCl acid after sandblasting. 1N HCl acid can be used to treat the titanium surface as negligible amount of chloride can be detected which would interfere with the bonding. This effectively decontaminated the titanium surface and removed the smear layer. Alloy primer (V-primer) was then applied to the chemically etched surfaces. Alloy primer promotes the diffusion of the functional monomers into the micro- and nano-scale cavities created by sandblasting and acid etching thereby decreasing the contact angle for bonding between resin cement and titanium. When the alloy primer comes in contact with the residual alumina particles, there results in an increase in the bond strength of the alloy primer to the residual alumina particles and ultimately the treated titanium surface thereby increasing the bond strength of the cements. Therefore, in this present study, it was observed that a combination of all these surface treatment produced the best bond strength. The results observed in this group are in agreement with a similar study, which concluded that combined use of sandblasting, application of etchant, and primer had a synergistic effect on titanium bonding. The SBS values for group 2 specimens were much less compared to group 4, group 1, and group 3. The specimens in this group underwent air-abrasion with alumina particles followed by chemical treatment using 1N HCl acid. Although this group had a combination of mechanical, as well as chemical treatment, it still showed poor bond strength. This signifies the role of alloy primer in achieving good bond strength. According to ISO 10477 requirements, the SBS at the interface between resin-based materials and substrate should be >5 MPa. In the present study, group 2 and the control group showed mean SBS values lower than 5 MPa. Therefore, surface treatment is essential for achieving the desired bond strength. The luting composite used in this study, Superbond C and B, includes 4-META as the functional monomer and has been reported to yield high bond strengths between resin-based materials and base metal alloys. The resin structure has a micro hardness and flexural modulus substantially lower than other composite resin cements. Because of its low modulus of elasticity, the Superbond cement displays high plastic deformation and simply changes shape. This resilience gives Superbond a significant advantage over traditional adhesive cements. Light cured cement was not used in this study as curing the cement through titanium, where it is intended to be used clinically, would be very difficult. Dual cured cement was also not recommended in this study for the fact that, it could get cured both chemically, as well as by light. The bond strength of self-cured resin cement is more when compared to dual-cured resin cement. Moreover, the bond strength of chemically activated dual-cured resin cement is much lesser compared to light and chemically activated dual-cured resin cement. The significant improvement in the SBS of titanium disks was because of the combined effect of all the surface treatments. Therefore, from this study, it can be concluded that a combination of all the surface treatment, both mechanical and chemical, produces a stronger and more durable bond between the resin cement and titanium. However, there are certain limitations of the study. SBS is not the only factor that may influence the durability of resin-metal bonds. Careful interpretation of the clinical implication of these results is suggested. Thermal cycling of specimens accelerates the diffusion of water between the resin and metal or ceramic, decreases the bond strength, but represents a limited simulation of the intraoral situation. Therefore, the specimens should be subjected to long-term storage under simulated oral conditions and fatigue loading for evaluation of their performance during clinical service. Combined mechano-chemical treatments of commercially pure titanium can be employed in day-to-day clinical practice, which proves to be beneficial in enhancing the adhesion of resin luting cements, thereby improving the retention and longevity of the prosthesis. Lowest SBS values were yielded by the control group (no surface treatment) followed by group 2 (grit blasting and chemical treatment). The SBS values for these groups were <5 MPa, and hence not suitable for clinical situations. Scarano A, Piattelli M, Vrespa G, Caputi S, Piattelli A. Bacterial adhesion on titanium nitride-coated and uncoated implants: An in vivo human study. J Oral Implantol 2003;29:80-5. Parr GR, Gardner LK, Toth RW. Titanium: The mystery metal of implant dentistry. Dental materials aspects. J Prosthet Dent 1985;54:410-4. Zavanelli RA, Pessanha Henriques GE, Ferreira I, De Almeida Rollo JM. Corrosion-fatigue life of commercially pure titanium and Ti-6Al-4V alloys in different storage environments. J Prosthet Dent 2000;84:274-9. Wang RR, Fenton A. Titanium for prosthodontic applications: A review of the literature. Quintessence Int 1996;27:401-8. Fawzy AS, El-Askary FS. Effect acidic and alkaline/heat treatments on the bond strength of different luting cements to commercially pure titanium. J Dent 2009;37:255-63. May KB, Fox J, Razzoog ME, Lang BR. Silane to enhance the bond between polymethyl methacrylate and titanium. J Prosthet Dent 1995;73:428-31. Koizumi H, Furuchi M, Tanoue N, Yanagida H, Yoneyama T, Matsumura H. Bond strength to primed Ti-6Al-7Nb alloy of two acrylic resin adhesives. Dent Mater J 2006;25:286-90. Ban S, Taniki T, Sato H, Kono H, Iwaya Y, Miyamoto M. Acid etching of titanium for bonding with veneering composite resins. Dent Mater J 2006;25:382-90. Tsuchimoto Y, Yoshida Y, Takeuchi M, Mine A, Yatani H, Tagawa Y, et al. 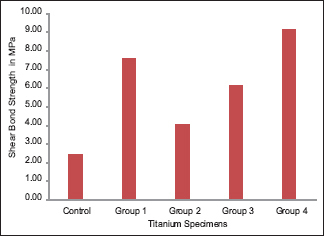 Effect of surface pre-treatment on durability of resin-based cements bonded to titanium. Dent Mater 2006;22:545-52. Fonseca RG, de Almeida JG, Haneda IG, Adabo GL. Effect of metal primers on bond strength of resin cements to base metals. J Prosthet Dent 2009;101:262-8. Taira Y, Yoshida K, Matsumura H, Atsuta M. Phosphate and thiophosphate primers for bonding prosthodontic luting materials to titanium. J Prosthet Dent 1998;79:384-8. Watanabe I, Kurtz KS, Kabcenell JL, Okabe T. Effect of sandblasting and silicoating on bond strength of polymer-glass composite to cast titanium. J Prosthet Dent 1999;82:462-7. Egoshi T, Taira Y, Soeno K, Sawase T. Effects of sandblasting, H2SO4/HCl etching, and phosphate primer application on bond strength of veneering resin composite to commercially pure titanium grade 4. Dent Mater J 2013;32:219-27. Imai H, Koizumi H, Shimoe S, Hirata I, Matsumura H, Nikawa H. Effect of thione primers on adhesive bonding between an indirect composite material and Ag-Pd-Cu-Au alloy. Dent Mater J 2014;33:681-8. Ohkubo C, Watanabe I, Hosoi T, Okabe T. Shear bond strengths of polymethyl methacrylate to cast titanium and cobalt-chromium frameworks using five metal primers. J Prosthet Dent 2000;83:50-7. Al Hussaini I, Al Wazzan KA. Effect of surface treatment on bond strength of low-fusing porcelain to commercially pure titanium. J Prosthet Dent 2005;94:350-6. Bulbul M, Kesim B. The effect of primers on shear bond strength of acrylic resins to different types of metals. J Prosthet Dent 2010;103:303-8. Fonseca RG, Haneda IG, Almeida-Júnior AA, de Oliveira Abi-Rached F, Adabo GL. Efficacy of air-abrasion technique and additional surface treatment at titanium/resin cement interface. J Adhes Dent 2012;14:453-9. Almilhatti HJ, Neppelenbroek KH, Vergani CE, Machado AL, Pavarina AC, Giampaolo ET. Adhesive bonding of resin composite to various titanium surfaces using different metal conditioners and a surface modification system. J Appl Oral Sci 2013;21:590-6. Taira Y, Yanagida H, Matsumura H, Atsuta M. Effects of a metal etchant and two primers on resin bonding durability to titanium. Eur J Oral Sci 2004;112:95-100. Petridis H, Garefis P, Hirayama H, Kafantaris NM, Koidis PT. Bonding indirect resin composites to metal: Part 2. Effect of alloy surface treatment on elemental composition of alloy and bond strength. Int J Prosthodont 2004;17:77-82. Reza F, Lim SP. Effects of curing mode of resin cements on the bond strength of a titanium post: An intraradicular study. J Conserv Dent 2012;15:123-6.